The Solar Electronics LISNs use a series inductor between the test sample and the power source to provide the impedance-versus-frequency characteristic. A coaxial connector with DC isolation is provided for connection to the associated frequency selective EMI meter. The power source end of the inductor is bypassed to ground. Due to the large current-carrying capability of some LISNs, it is not always practical to use a switch for changing inductance values. 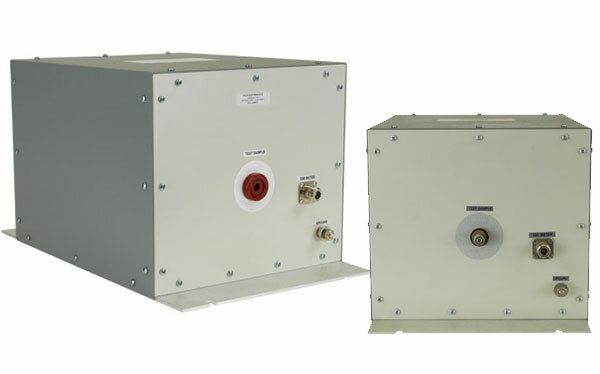 Instead, some models are equipped with a high current pin plug-and-jack combination for quickly connecting and disconnecting a network and substituting another. This nylon insulated pin plug-and-jack arrangement is a safety feature, well isolated from inadvertent short circuits, providing protection to operating personnel. Current ratings up to 200 A are available in 50 µH styles and 500 A in 5 µH styles (see chart under Specifications tab). EMI specifications require one LISN in each ungrounded power lead. Even though the neutral is considered "ground" if it is not connected to chassis inside the unit under test, the lead must be tested with an LISN. Therefore, use two LISNs in DC or single phase AC applications, three LISNs for delta-connected three phase circuits, and four LISNs for Y-connected three phase circuits. 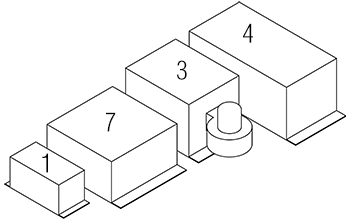 1: 5.26" x 5.29" x 10.00" (13.36 cm x 13.44 cm x 25.40 cm). Overall length with base plate: 12.00" (30.48 cm). 2: 7.00" x 7.00" x 8.25" (17.78 cm x 17.78 cm x 20.96 cm). 3†: Equipped with 6.50” (16.51 cm) 50-60 Hz ventilating fan. Specify voltage: 110V/115V or 220V/230V. Overall length with base plate and fan overhang: 21.50” (54.61 cm). 4: 10.29" x 9.25" x 20.00" (26.14 cm x 23.50 cm x 50.80 cm). Overall length with base plate: 23.75” (60.33 cm). 5: 3.12" x 1.75" x 3.87" (7.93 cm x 4.45 cm x 9.83 cm). 6: 2.75" x 2.45" x 5.70" (6.99 cm x 6.22 cm x 14.48 cm). 7: 13.48" x 7.25" x 13.25" (34.24 cm x 18.42 cm x 33.66 cm). Overall length with base plate: 17.25” (43.82 cm).